C919 AC101 successfully flew from Shanghai to Yanliang, Xi'an__Commercial Aircraft Corporation of China, Ltd.
C919 AC101 successfully flew from Shanghai to Yanliang, Xi'an on November 10th, 2017. 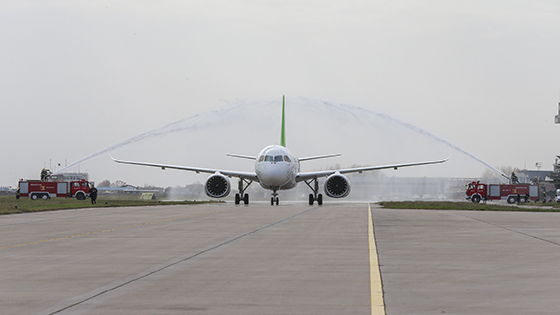 The large passenger aircraft C919 AC101 independently designed and developed by China completed the first intercity flight and flew to Yanliang, Xi’an successfully on November 10th, 2017. The aircraft took off from the fourth runway of Shanghai Pudong International Airport at 11:38 in the morning of November 10th, 2017, and arrived at Yanliang airport of Xi'an at 14:02 after a flight of 2 hours and 24 minutes. During the flight, the aircraft flew at a maximum altitude of 7,800 meters and a cruise Mach number of 0.74. It flew across Jiangsu, Anhui, Henan, Shanxi and other places with a range of about 1,300 kilometers. In the air, all system functions of the aircraft were normal and the condition of aircraft was good. 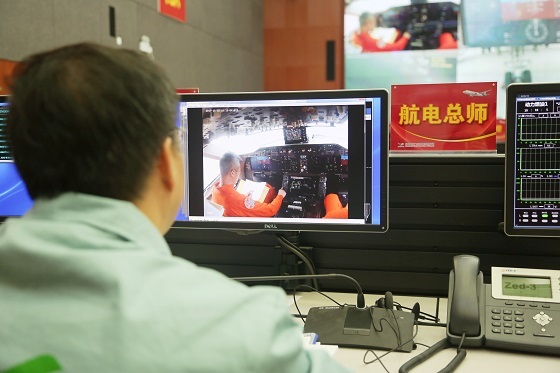 COMAC Flight Test Center (CFTC) and Chinese Flight Test Establishment (CFTE) would cooperate in the subsequent flight test and certification test. This ferry flight was performed by CFTC Test Pilots Cai Jun and Wu Xin, Observer Zou Lixue, and Flight Test Engineers Dai Wei and Liu Lisu. Mr. He Dongfeng, Chairman and Secretary of the Party Committee of Commercial Aircraft Corporation of China, Ltd. (COMAC) and General Director of C919 Program, Mr. Zhang Yanzhong, Chairman of Advisory Committee on Large Aircraft Projects of the State Council and Academician of the Chinese Academy of Engineering, Mr. Shi Jianzhong and Mr. Zhao Yuerang, Vice Presidents of COMAC, and leaders of CAAC East China Regional Administration, East China Regional Air Traffic Management Bureau, Shanghai Aircraft Airworthiness Certification Center and Shanghai Airport Authority directed the ferry flight at Pudong base of CFTC. 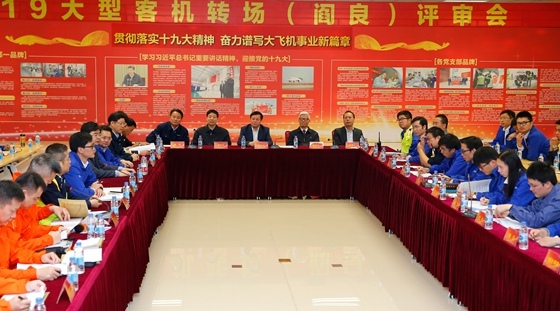 Mr. Liu Linzong, Deputy Secretary of the Party Committee and Vice President of COMAC, Mr. Wu Guanghui, Vice President of COMAC and Chief Designer of C919 Program, and officers of Aviation Industry Corporation of China (AVIC) welcomed C919 aircraft at Yanliang airport of Xi'an. 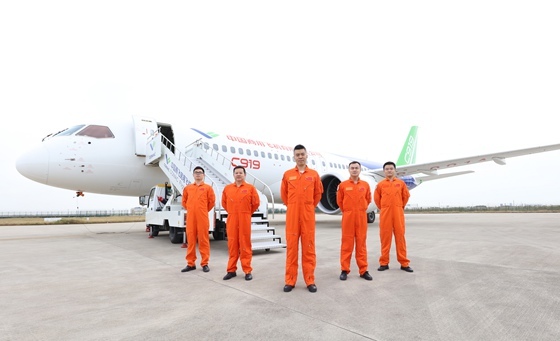 The successful first intercity ferry flight of C919 AC101 indicates that C919 aircraft is capable of flying intercity routes, its performance is preliminary verified to meet the design requirements, and the aircraft achieves the anticipated stable operating condition. From the aspect of the program, it means that C919 program has achieved periodical results, completed the phase of initial inspection flight test and entered the phase of envelope expansion flight test; C919 AC101 has completed the inspection flight test in Shanghai and flew to Yanliang, Xi’an to carry out development flight test and airworthiness certification in the next step. C919 is the first single-aisle trunk liner independently developed by China completely in accordance with the internationally advanced airworthiness standards and the prevailing market standards. European Aviation Safety Agency (EASA) accepted the application for type certificate for C919 in April 2017. C919 aircraft has completed 6 flights since its first flight on May 5th, 2017. At present, COMAC had a total of 27 customers of C919 aircraft and secured a total of 730 orders. 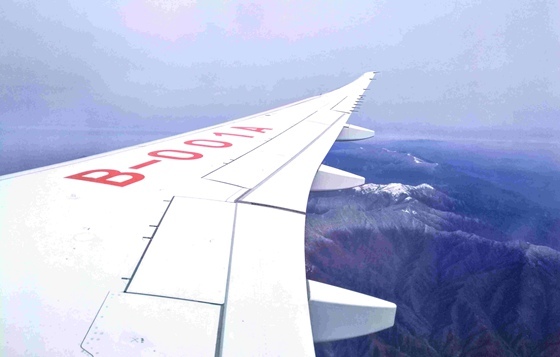 COMAC plans to put 6 test aircraft into flight test, and the second aircraft is trying to achieve the first flight by the end of the year. Recently, the first customer of C919 aircraft, China Eastern Airlines, appointed customer representatives to evaluate the cockpit and maintainability of the aircraft and comprehensively participate in the research and development of the aircraft. C919 program has been written in the report to the 19th National Congress of the Communist Party of China (CPC) as a major advance in science and technology toward making China a country of innovators. 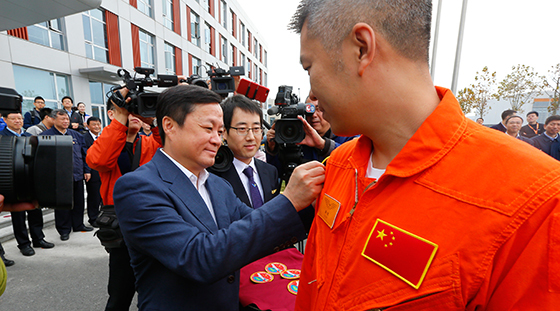 The people dedicated to trunk liner has remained true to their original aspiration, remembered the mission, practiced the spirits of the 19th CPC National Congress with concrete actions, successfully completed the long-distance ferry flight test, and strived to write a new chapter in trunk liner career in the new era. 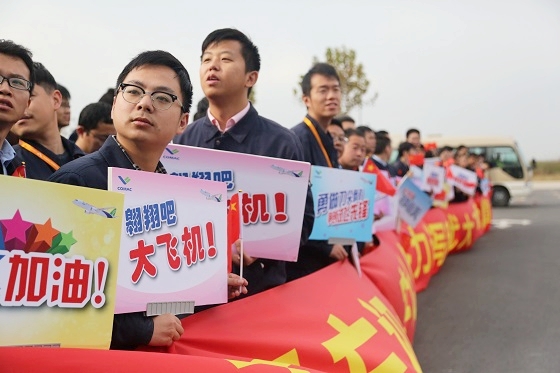 COMAC has comprehensively deepened the development strategy of the company, further deepened reform in accordance with the strategic deployment on socialism with Chinese characteristics for a new era, had the courage to innovate, made a resolution to win the "Three Battles", i.e. 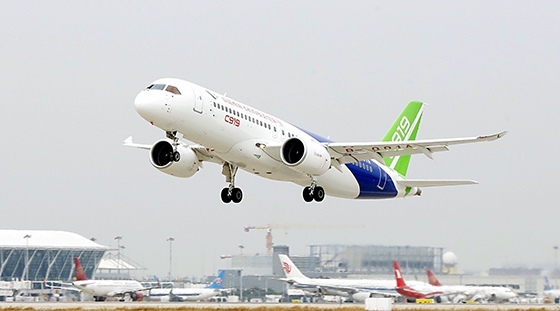 the flight test and certification of C919, the batch production and operation of ARJ21, and the research and development of CR929, and strived to "develop world-class products, build world-class brands, construct a world-class enterprise, and obtain world-class capabilities". After ferry to the flight test base of Yanliang, Xi'an, C919 aircraft would be engaged in more arduous tasks for airworthiness certification and flight test and lay a solid foundation for comprehensively carrying out the follow-up flight tests and eventually achieving development success, marketing success and commercial success of the aircraft. C919 AC101 took off from Shanghai Pudong International Airport at 11:38 on November 10th, 2017. C919 AC101 landed at Yanliang airport of Xi'an at 14:02 on November 10th, 2017. A photo taken before taking off on November 10th, 2017. A photo of the farewell crowd taken on November 10th, 2017. The aircraft was monitored closely by engineers on November 10th, 2017. A group photo of the ferry flight crew taken on November 10th, 2017. C919 successfully completed the first intercity ferry flight on November 10th, 2017.